Combat swords need to be made to a very high quality so that durability and usability are assured. 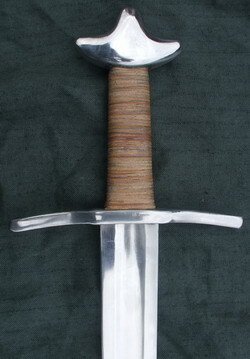 Below you will find a selection of historical swords made to be used by re-enactors. These swords vary, not only in their look but also in their handling characteristics. Taking the Viking period for example, the Petersen type "S" has massive lobaited fittings that increase the overall weight of the sword. Even though the type "S" is well balanced it tends to find favour amongst show fighters rather than competitive fighters. The Petersen type "C" on the other hand can be quite light overall and is favoured by competitive fighters. This is a Petersen type "S" sword with a vanadium steel blade. 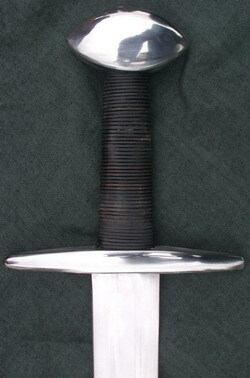 The hilt is available with or without decorative holes. Typical weight of this sword is 1.25kg with a 28" blade and 1.3kg with a 30" blade. The point of balance is kept at three fingers from the cross guard. 10th/11th Century Petersen Type "X"
Also known as a "T cosy " pommel this style of sword was common in the late 10th to mid 11th centuries. It has a straight forward hilt which gives it good balance for re-enactment when combined with the light, wide, fullered and slightly tapered blade. Typical weights for a 28" blade are from between 1 to 1.1 kg. and the balance point is three fingers from the cross guard. This sword is a late 10th early 11th century "Gaddhjalt" or spike hilt sword so called because of the longer more drawn out cross guard. It has a brazilnut pommel and it's typical weight is 1.25 kg at a 29" blade length. Shorter blades tend to look a bit small and short on these long cross hilts so I like to make the blade as realisticly long as possible. The sword is quite small and light and this translates into a re-enactment sword that is overall very light (under 1 kg) but that has a point of balance typically some 8 inches or so up from the guard which can make it slow to recover after a strike. 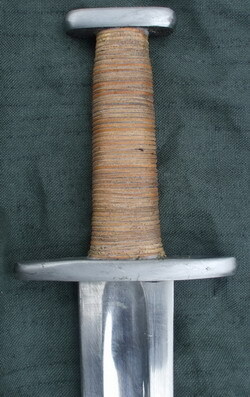 The Petersen type "M" sword is a very simple and crude hilt form. The lack of rivet holes either end of the upper cross (or pommel bar in a two piece pommel) gave the clue that these swords never had a full pommel cap attached to them. The swords tend to be plain unadorned iron and to have short blades - none of which I am aware at present had been pattern welded, though there probably is an example somewhere that proves the rule! Usualy held to be a lower status sword the shorter than average blades would have been easier to make out of poorer quality materials than the better weapons of the day. Now, as then, the shorter blades (25" to 27" or so) mean the balance is not as bad as a full length blade would exhibit on these pommel less hilts. This is a good sword type for those portraying a poorer warrior. 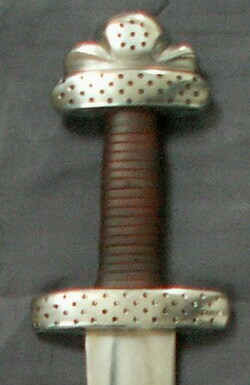 An 11th century sword with a long slightly down drawn cross and a pommel which is variant on the brazil nut or possibly a residual form simplified from some of the earlier Scandinavian styles of curved lobated pommels. Oakeshotte regards it as a Scandinavian type and his extensive researches have led him to comment that the type ran simultaneously with the brazil nut form, roughly from the early 11th century to the 13th centuries, becoming more massive and higher in the latter days of its use. The handling characteristics tend to be similar to that of the brazil nut pommeled sword in blade length and weight. 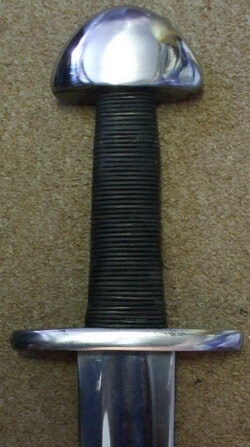 Petersen type "H" with ridged fittings and silver wire twist at the pommel and upper cross guard junction. 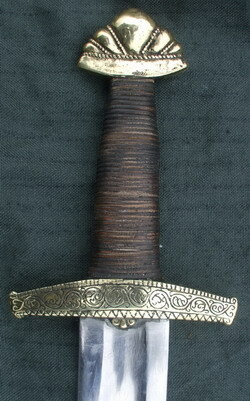 A classic form of early viking sword superficially resembling the simpler and slightly later type "C" triangular pommel. The type "H" has a 2 piece pommel and these pommel components (the upper guard and the pommel cap) are rivetted together either side by iron rivets, the heads of which are peened over on the underside of the upper guard. In some examples which have been X rayed it is apparent that these 2 rivets are in fact 1 U shaped piece of soft iron rod welded into the pommel cap. Unlike the type "C" many of the type "H" hilts have a great deal of overlay on them. A good choice for those with an interest specifically in the early part of the viking age.